This article is about reminders of the Buddha. For the architectural form, see stupa. Cetiya, "reminders" or "memorials" (Sanskrit caitya), are objects and places used by Theravada Buddhists to remember Gautama Buddha. According to Damrong Rajanubhab, four kinds are distinguished in the Pāli Canon: "Relic [Dhatu], Memorial [Paribhoga], Teaching [Dhamma], and votive [Udesaka]." Griswold, in contrast, states that three are traditional and the fourth, the dhamma, was added later to remind monks that the true memory of Gautama Buddha can be found in his teachings. While these can be broadly called Buddhist symbolism, the emphasis tends to be on a historical connection to the Buddha and not a metaphysical one. The sārīraka (Sanskrit śarīra) or dhātu cetiya, the remains of Gautama Buddha's body, are the category commonly considered "relics" today by Western observers, and were responsible for major forms of Buddhist art and symbolism, although they only constitute one of the three categories of reminders. Most frequently preserved parts of Buddha's body are tooth and bone, because these parts would remain after the rest of the body decayed. The relic of the tooth of the Buddha in Sri Lanka is the most notable site where a relic is visibly preserved, but hundreds of such sites were created, in the architectural form now called a stupa. In Thai, these stupas are called chedī, retaining the second half of the phrase dhātu cetiya; in Lao, they are called that after the first half. Beyond the stupa itself, sārīraka are used across the Buddhist world, in such quantity that not all could be legitimate; in this sense the sārīraka functions mainly as a symbol, with the importance of authenticity varying between cultures. More relics of bone were discovered during archaeological excavations of a stupa built in what is now Peshawar by Kanishka of the Kushan Empire in the second century. In 1909, three pieces of bone (approx 1½ in. or 3.8 cm long) were found in a crystal reliquary in a bronze casket bearing an effigy of Kanishka and an inscription recording his gift. They were removed to Mandalay in 1910 by Gilbert Elliot-Murray-Kynynmound, 4th Earl of Minto, the Governor-General of India, for safekeeping. They were originally kept in a stupa in Mandalay but it has become dilapidated and is used as housing. The relics are being kept in a nearby monastery until funds can be found to build a new stupa to house the relics next to Mandalay Hill. The crystal reliquary holding the bones is now enclosed in a gold and ruby casket provided by Burmese devotees. The miniature gold stupa in which they were transported to Mandalay may be seen in the photo to the right of the modern ruby and gold reliquary. The body parts of especially powerful monks are also called sārīraka, but these usually take on the form of bright jewels formed during the cremation of the body. The paribhoga cetiya, things used by the Buddha, would seem at first to be a nonexistent category today. However, temples such as Tongdosa in South Korea claim to keep his robe and begging bowl. The category also includes all places the Buddha visited, so Bodh Gaya itself functions as a paribhogaka. The most common paribhogaka is the Bodhi Tree, which was transplanted across Southeast Asia; cuttings of the original bodhi tree still survive today in Sri Lanka. A Buddha footprint, showing the Buddhist wheel and a larger-than-life foot. 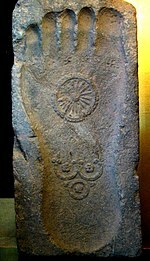 Another extremely common paribhoga cetiya is the Buddha footprint, which are found across the Buddhist world symbolizing the ground that Buddha walked on and the powerful size of his dhammakāya. Sometimes these footprints are also classed as udesaka, a representation of the Buddha's foot, or sārīraka, implying that the footprint was the foot itself. Buddha's departure from the lay life as depicted at Gandhara in the early second century CE. The final category, udesaka or uddesika cetiya, literally translates as "indicative reminders" or "votive objects", for example images of the Buddha. Udesaka do not have any physical connection to the Buddha but still serve as relics because they were created in his memory. Originally udesaka were secondary to paribhogaka and sārīraka, but with the influence of Greco-Buddhism, statues of the Buddha were produced in great numbers, followed later by paintings and other images. The dharmachakra "wheel of the dharma", falls under this category as a reminder of Buddhist insight. The conventional view has long been this meant that early Buddhist art was aniconic. However, this view has recently been the subject of debate among specialists. There does not seem to have been any prohibition of creating images of the Buddha. Rather, creating images of the paribhogaka was regarded as a more fulfilling and meaningful symbol by the early Buddhists, evoking the discovery of Buddhist understanding (pañña). Whether these scenes contained substitutes for the image of Buddha himself is currently under debate. ^ Damrongrāchānuphāp (1962). A History of Buddhist Monuments in Siam. Siam Society. pp. 10, 21. ^ Griswold, Alexander B. (1990). What is a Buddha Image?. Promotion and Public Relations Sub-Division, Fine Arts Department. pp. 14–15. ^ "Two Gandhāran Reliquaries" K. Walton Dobbins. East and West, 18 (1968), pp. 151-162. ^ "Is the Kaniṣka Reliquary a work from Mathurā?" Mirella Levi d’Ancona. Art Bulletin, Vol. 31, No. 4 (Dec., 1949), pp. 321-323. ^ The Stūpa and Vihāra of Kanishka I. K. Walton Dobbins. (1971) The Asiatic Society of Bengal Monograph Series, Vol. XVIII. Calcutta. ^ Huntington, Susan L. (1990). "Early Buddhist Art and the Theory of Aniconism". Art Journal. 49 (4): 401–408. doi:10.2307/777142. JSTOR 777142. ^ Kinnard, Jacob N (2013). Imaging Wisdom: Seeing and Knowing in the Art of Indian Buddhism. Routledge. p. 77. ISBN 978-1-136-77924-4. ^ Huntington, Susan L. (1992). "Aniconism and the Multivalence of Emblems: Another Look". Ars Orientalis. 22: 111–156. doi:10.2307/4629428. JSTOR 4629428.